If you don't want powered, noise-cancelling or wireless headphones then these provide an affordable access point for a relatively neutral listen. Not all headphones are made equal. There are a lot of choices on the market to suit different tastes - whether you want banging bass, noise-cancellation for travelling, or something more neutral like the Beyerdynamic DT 770. These comfortable over-ear cans are designed as closed studio reference headphones, so they don't come with fancy features like many on the market, but they are affordable and good all-round quality. Well, they are if you pick the right ones and don't expect to have a lot of external noise around you, hence them being for studio work. If you want them for out-and-about use then the 32ohm-rated cans will be your choice (the 80ohm and 250ohm will need separate amplification). We've been wearing the DT 770 while out and about. Yes, they're big, but they're just about manageable to use on the go. Don't expect any fanciful folding to save on space in a bag, but you do get a carry pouch included in the box. Being a bit negligent ourselves we've rarely used this pouch, which has led us to find the only issue in build quality: that the white paint of the “DT 770” embossing on the exterior of the earcups can rub off a little, revealing the black plastic beneath; the black metal can also scratch, exposing the silver sheen beneath. Otherwise, while not distinctively marketed as being rugged headphones, the DT 770 have soldiered on through weeks of use non-stop without issue. Sure, they're otherwise plastic by build, but that keeps the lightweight (270g) and there's none of the naff plastic sheen some manufacturers prefer to use, so no horrid fingerprinting. That large size owes to making them comfortable too: cushy padding on the earcups is substantial, and while our ears do touch the interior cloth we've not found it to be unpleasant at all. Some cans with deeper cavities might give a better sense of spatial separation. 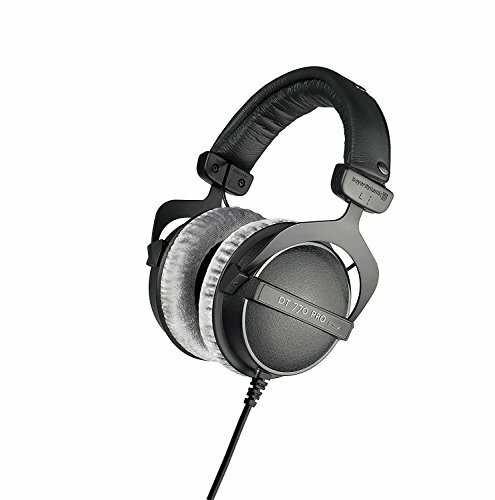 Beyerdynamic says that every part of the headphones is replaceable, which could be useful after a long period of use. But given their sub-£120 price point, you could happily run these into the ground and buy a fresh pair later down the line instead. One point to note is that the 3.5mm cable isn't removable at the headphone end, so you can't swap its position from left to right ears like some higher-end studio headphones offer. Not that you'll need to worry about the wire getting pulled out unnecessarily, and obviously there's no wireless use here. Sound quality is subjective, but if you don't enjoy those bass-ramped kind of headphones then a more open and neutral listen like these Beyerdynamic cans ought to appeal. The DT 770 work their best without surrounding distractions. When out and about external noise affects the perceptible bass response, but that's not to say the bass doesn't exist: it's taut, flat and unimpinged. There's enough kick from drums, while basslines hum along nicely without breaking up the rest of the sound. Mid-range is subtle, less present than in some competitors, but that stops snare drums from smashing your ear canals to death. Vocals can seem a little thin, however, and extraneous sounds can further distract. What certainly doesn't lack in any capacity is the high-end, which sparkles. Indeed, some might call it a little too sharp. We rather like the way this top-end sits away from the rest of the mix. We're obviously reviewing the 32ohm impedance version of the DT 770, which are plenty loud when listening from smartphone, laptop and the like. If you're worried about loudness levels then there's nothing to fear here. But, as we say, limited isolation will affect the way these cans sound - and we've found them by and large best for home listening without distractions. Some better known brands will charge you a fortune for the pleasure of wearing a brand name across your head. While Beyerdyanmic is respected, it's also respectful in the price stakes: as the DT 770's sub-£120 price point attests. If you want better build quality then go up a grade to the DT 990. There are no mod cons here, though. The DT 770 are all about a wired and neutral listen, without any noise-cancelling or wireless. They provide a decent response across their range - just try and avoid external noise which can affect the perceptible bass levels. And that's the rub of the DT 770: if you don't want powered, noise-cancelling or wireless headphones then these provide an affordable access point for a relatively neutral listen.